Although tours of all lengths and destinations are available to see the diversity of this amazing area, you probably will want to rent a car to explore many of the places on your own. One of your first trips will be into Yellowstone National Park where Old Faithful geyser is the best-known attraction. It, however, is but one of more than 10,000 other geothermal features in this national park. These include more geysers, mudpots, hot springs, and fumaroles. In recent years, some of these dormant geysers have started to spout again. The Old Faithful Inn celebrated its 100th anniversary in 2004. This is the most historic of all the lodges in national parks. The massive log work of this century-old lodge will be seen as even more inspiring when you enter the lobby and look upward to realize the size of this structure. Throughout the summer season, free tours are offered. As of late 2004, snowmobiling was still permitted in Yellowstone Park. Temporary use plans are in effect while a new environmental assessment is conducted. You will go on guided snowmobile tours, as self-guided ones are no longer permitted. The tours will take you through deep-powder fields where you will see abundant wildlife. Advance reservations are required. There are many places outside the park, however, where you can saddle up and go on your own. This area has about 40 inches of powder every winter. The Continental Divide Scenic Trail ride takes you through about 68 miles of the Bridger Teton National Forest. The tour starts at 7:30 in the morning with a hearty breakfast before you board—in winter—a clean and quiet Arctic Cat snowmobile. The leisurely pace of this tour gives wonderful opportunities to take pictures of this pristine area. You will be much more comfortable than the pioneers were when you take a Teton Covered Wagon Train adventure. The Conestoga wagons look like the old covered wagons drawn by four horses, but they have rubber tires and padded seats for your comfort as you journey from camp to camp. If you want to venture off the trail into the backcountry and see the waterfalls, go on horseback. The journey takes four days and three nights. The trail is located in the Targhee National Forest between Yellowstone and Grand Teton Parks. You will camp at a different place each night where you might be visited by moose, elk, or deer. The Conestoga chuck wagon rolls in and the meals are prepared in Dutch Ovens over an open fire. Tenderfoots will find the wagon master and cowboy guides well versed and capable in making your trek safe and enjoyable. Some persons confuse Jackson Hole with the town of Jackson, Wyoming. 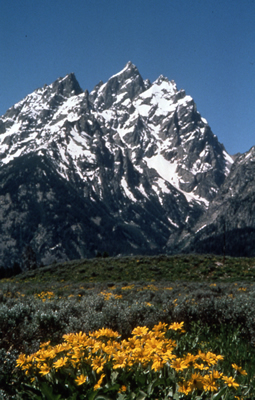 Jackson Hole refers to a valley 48 miles long surrounded by high mountains. Mountain men called any valley surrounded by mountains a “hole.” Several towns are within this valley and all are worth a visit—Teton Village, Moose, and Kelly, to name a few. Jackson is the southernmost community in Jackson Hole and offers an opportunity for shopping, dining, and nightlife, even though its population is less than 10,000. The town has so many eating places that locals say more than half the town’s residents could eat out at the same time and still not fill the more than 100 restaurants. Jackson also has the longest-running gun-fight in the world, which began in 1957. It occurs on the Jackson Town Square six nights a week from May to September. Other towns in the area have different attractions, which is why you will want to have a rental car. Just 52 miles east of the east entrance to Yellowstone National Park you will visit Cody, the town founded in 1887 by William F. “Buffalo Bill” Cody. The drive over through the Wapiti Valley is scenic. Theodore Roosevelt declared it to be “the 50 most beautiful miles in America.” But if you prefer to arrive at Cody and stay nearby, the Yellowstone Regional Airport is just two miles southeast of the town. Summer would be the best time to visit Cody, as this is when the town puts on its western charm with rodeos and a cowtown circus. In the Buffalo Bill Museum you will find memorabilia and mementos of the times of this great showman and perhaps hear more about the legend of his burial. Local legend has it that Cody is buried on Cedar Mountain just outside the town, not on Lookout Mountain in Golden, Colorado. Folks here will tell you that after Cody’s demise in 1917 when the mayor of Denver and The Denver Post newspaper wanted to have his grave as part of a tourist attraction, locals would have no part of it. Before the funeral in Denver, they say the body was swapped for a cowboy in town who died with no kin and Bill was brought back to overlook the town he founded. Another place you will want to visit in Cody is the Plains Indian Museum. This museum, reopened in 2000 after renovation, shows the histories, cultures, and traditions of the Plains Indian peoples. The Indian art here is nationally recognized. The town of Cody is roughly the same size as Jackson, but less populated with resorts so you get more of the feeling of the old west here. Several ghost towns nearby are inviting stops. Kirwin, for instance, was started in 1885 when gold was discovered there. The town had about 200 residents and 38 buildings in its heyday. In the winter of 1907, a massive snow storm hit dropping 50 to 100 feet of snow in only eight days. An avalanche swept down on the town killing several and destroying some buildings. Today, you can see a few buildings that remain along with remnants of other buildings and pieces of mining equipment. 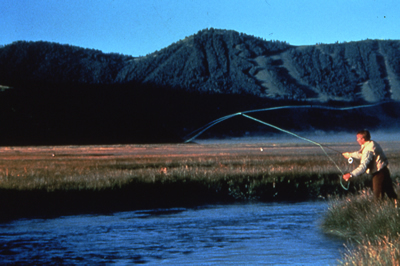 The Jackson Hole area is one of the most ecologically protected spots in the country. Only three percent of the land in Teton County is privately owned. Ninety-seven percent of the land—some 2.6 million acres—is federally owned or state managed. The beauty of it has long been recognized. More than 15 feature motion pictures have been filmed here. Grab your camera and come along to not only the place where the deer and the antelope roam but where your spirits will soar. The Jackson Hold Municipal Airport has scheduled service by several trunk and regional airlines. The Cody Yellowstone Regional Airport is a good destination and has rental cars available. It, too, has service by several airlines. Some flights go first to Salt Lake City with regional connections to the Jackson Hole area. At the inexpensive level, Jackson’s Hostel the Bunkhouse offers facilities for $22 per person per night. Many, many more places are available throughout the Jackson Hole area and at Cody. The above rates are just samples and, of course, are subject to change. Check rates and book your room with WTA's Travel Booking Service that offers discounts at many hotel properties, plus you can book rental cars, vacation rental properties, and air, too. Cadillac Grill-dinner entrees $8 to $35 and up. Bar J Chuckwagons and cookouts—entertainment with your meal. Snake River Brewing Company—a small brewery, entrees $9 to $12. Mangy Moose—saloon area, dining entrees $18 and up.